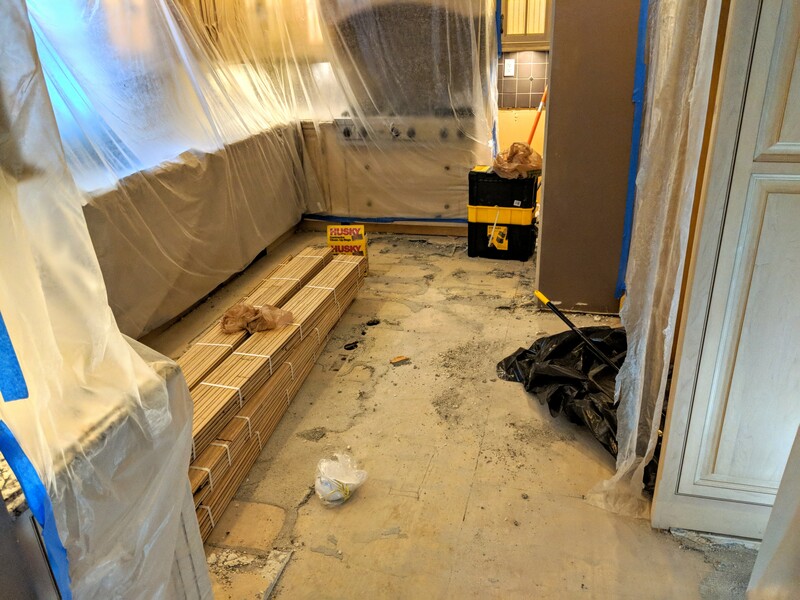 Floor: Yesterday the floor guy did his very best to demo the tile floor in the kitchen. It looked like a real struggle. That tile looks like it was bonded to that sub floor for life! I talked to him this morning and he said it was a killer. 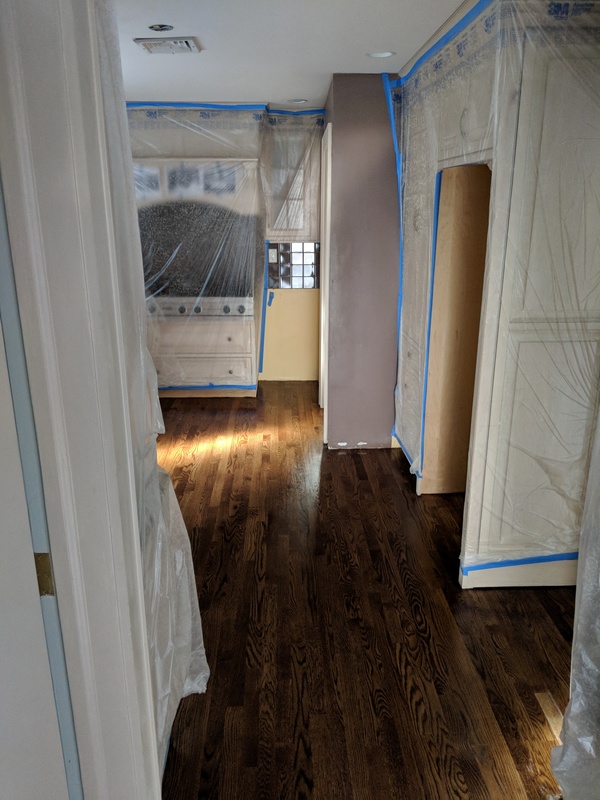 The plan is to have the floor finished by Sunday! I can’t wait! We got rid of the old white fridge in a bit of a panic. The day before the floor demolition started we realized we didn’t want to move the old fridge into the living room. It would thaw out and most likely leave a rotten puddle where ever we put it. Kate put the fridge for sale on a site called swap and in and hour there was a Mexican family over at the house to pick it up. Everyone came along. I was ready to help move the fridge but the guys took one look at me and laughed. They exchanged some words in Spanish of which I can only assume were flattering to me. They had the fridge out in no time and into their van. 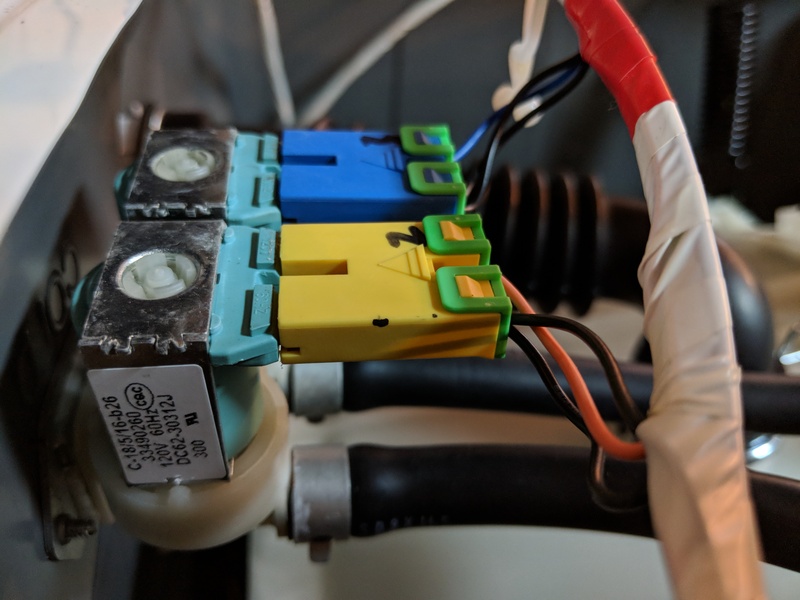 Moments later the door bell rang and there was a request for jumper cables. They left the lights to the van on while we moved the fridge. Owning my own van I had cables at the ready and we had that van jumped in 5 minutes. 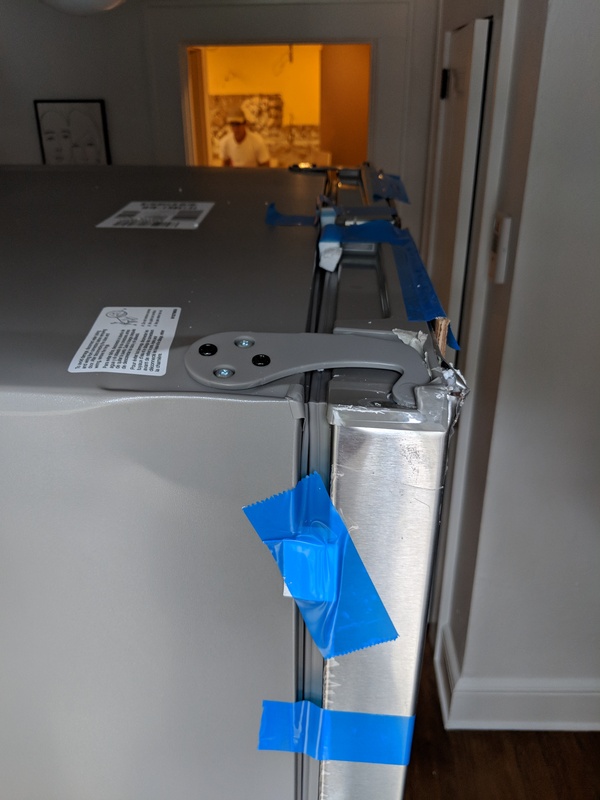 So glad to get that fridge out of the way. We have one in the basement we are using for the moment. The new one will be here early next week. All in all things are progressing well. Lots more to do! See the crazy bonding agent by the door. 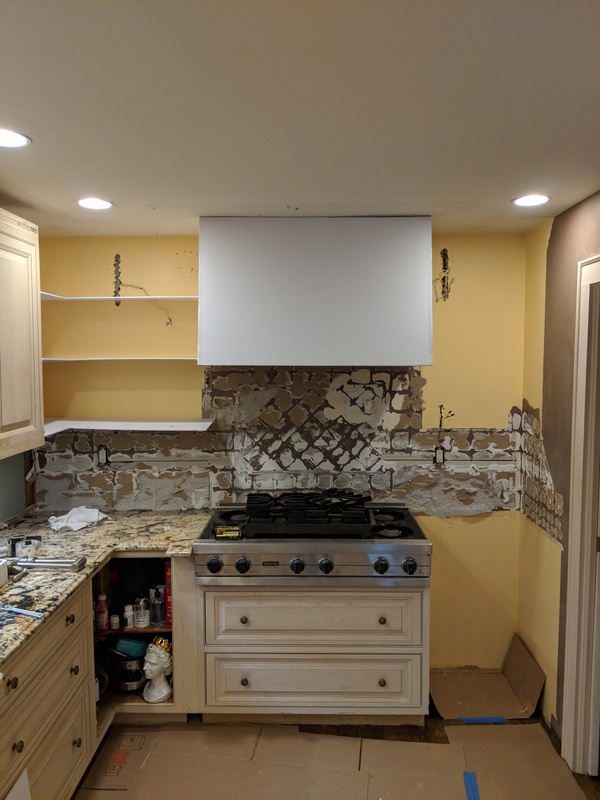 It must have been a buster to get that tile up! As promised progress reports have started! 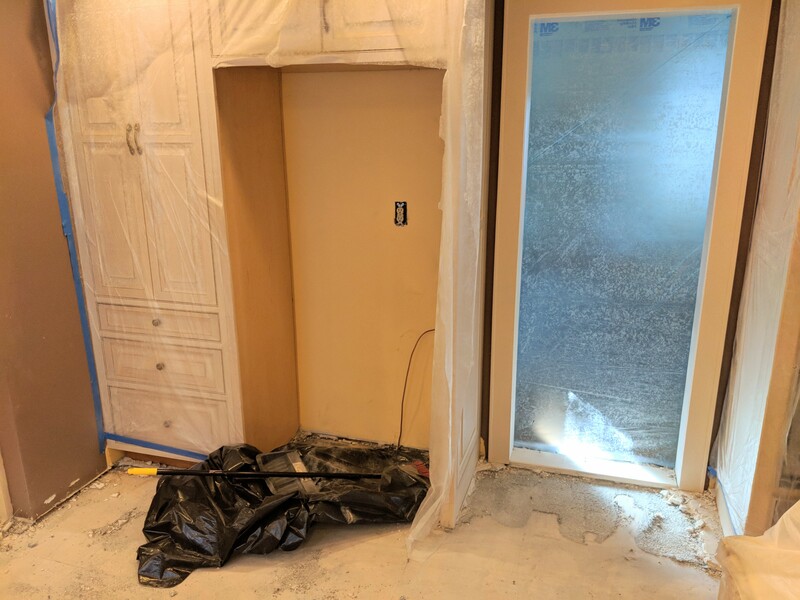 Monday and Tuesday saw the first steps of the kitchen project take form. 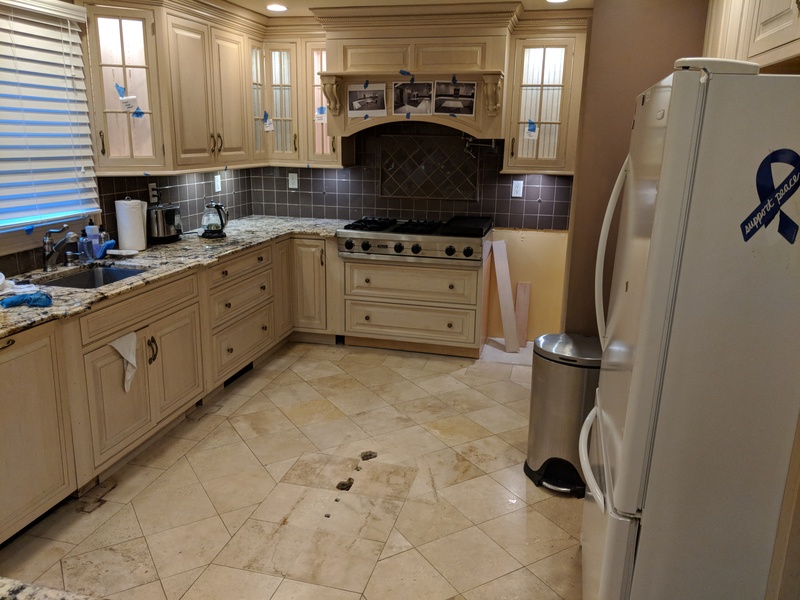 Doug came by and ripped out the island and removed all the decorative elements of the lower cabinets that might impeed the installation of the floor on Thursday. 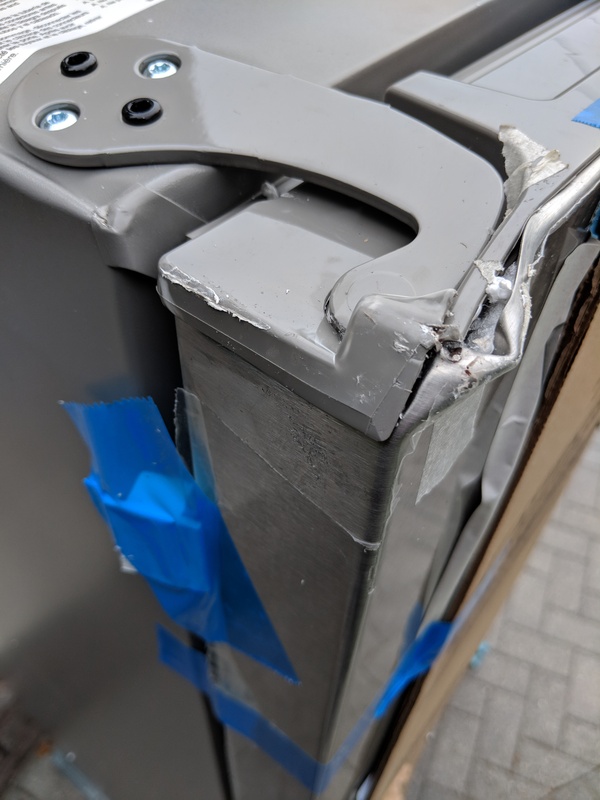 You will also see that the wine fridge got delivered and we moved it into place to see how it fit. It fits like a glove! 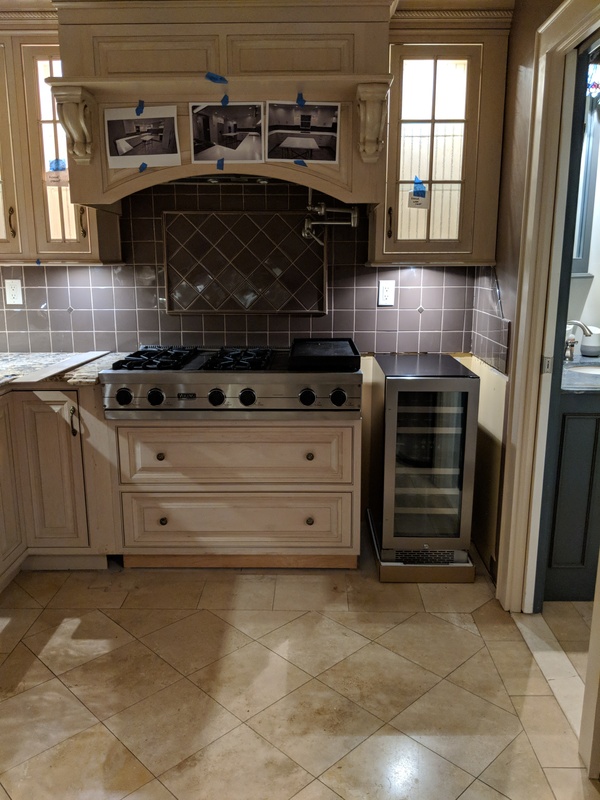 Notice the range and cabinets that bumped out are now flush with the rest of the kitchen! 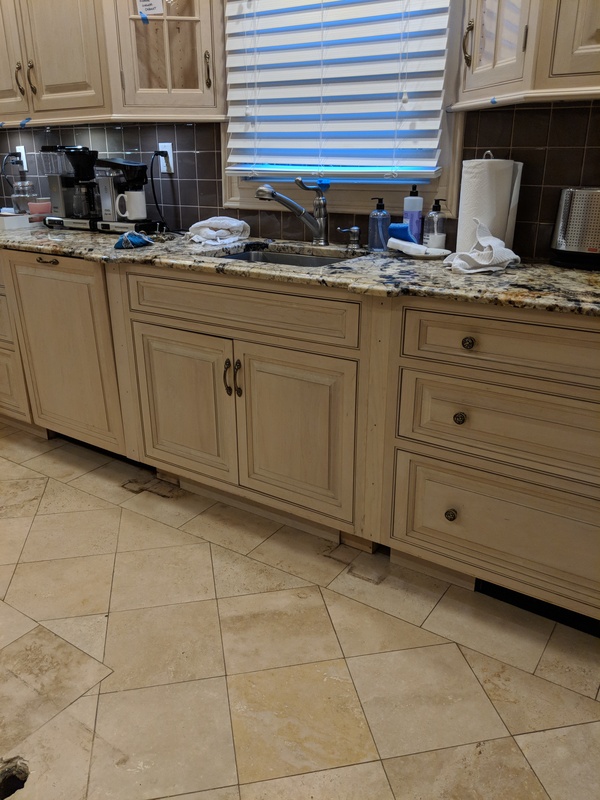 The holes in the floor are due to the sink that was in the island. We removed it because we didn’t use it and it was not helpful. We are in full on go mode for the kitchen. On Saturday we got the downstairs shower situation figured out. 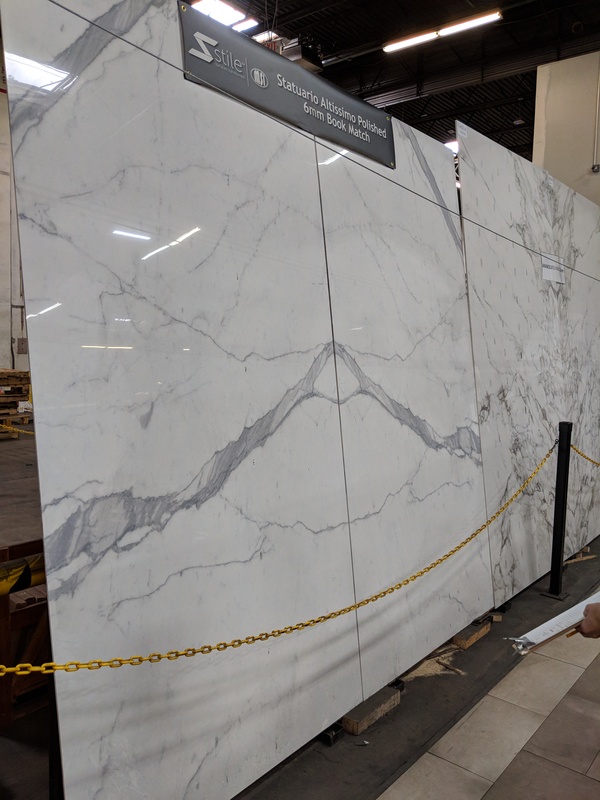 We wanted it to be huge porcelain slabs. We went to the warehouse whete such things are stored. It was impressive but a bit “too much” for the small space that is our bathroom. 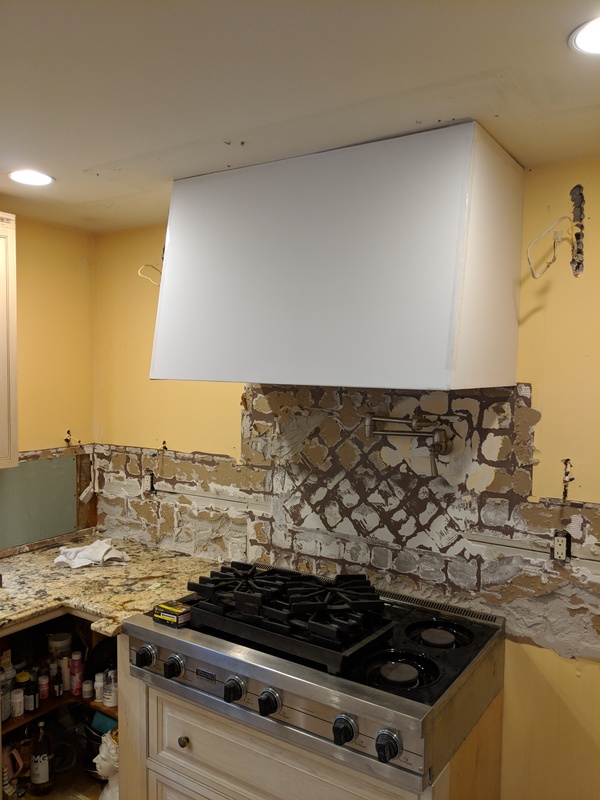 That said we found some more restrained large tile that should do the trick. This is the porcline, too much! so you can see. Sunday we went to look at the countetop Kate picked out. The guy that works at the countertop place was great. Possibly too into Stone and Quartz but that should work in our favor in the long run. Now here’s the thing. 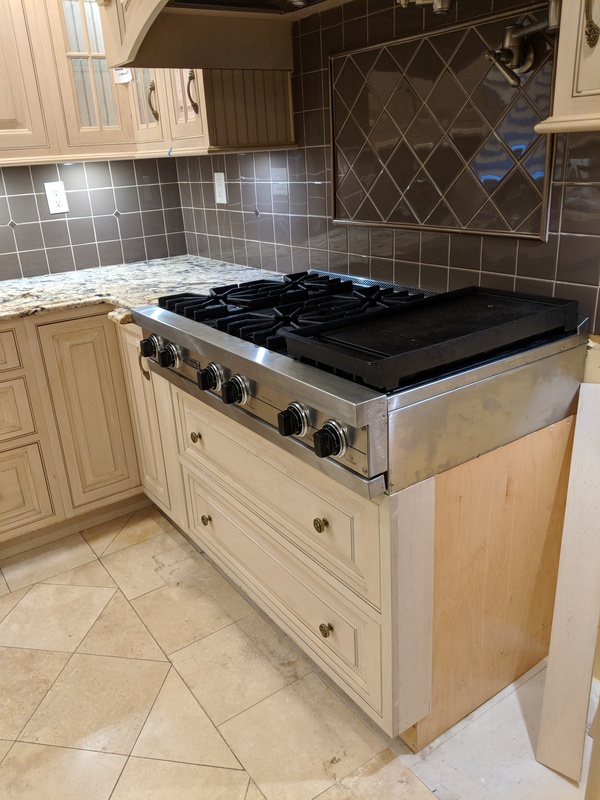 I think a 1/4 chamfer would look great on the edge of the countertop. Kate wants just a radius. This is a tough one. Haven’t decided yet. 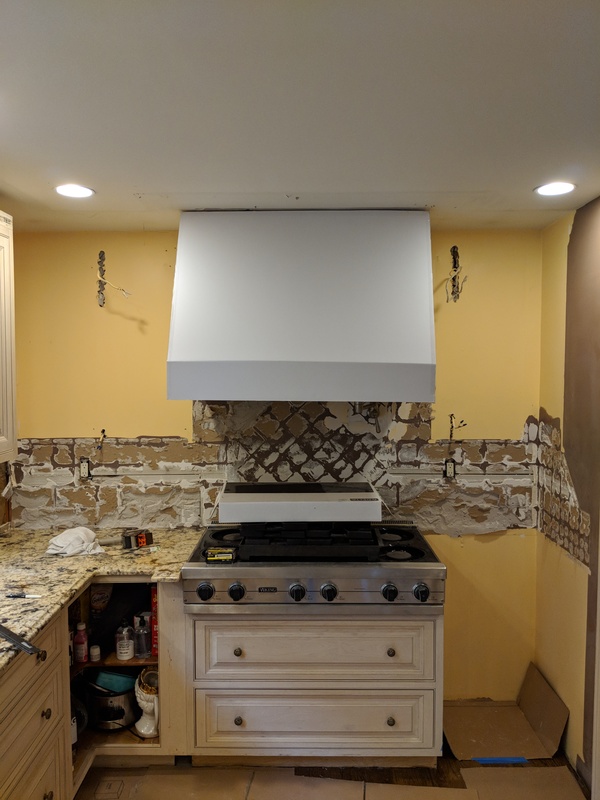 Demolition starts this week with the removal of the island and much of the added embellishments that make our kitchen so gaudy. The floor goes in Thursday so look for some more progress reports. 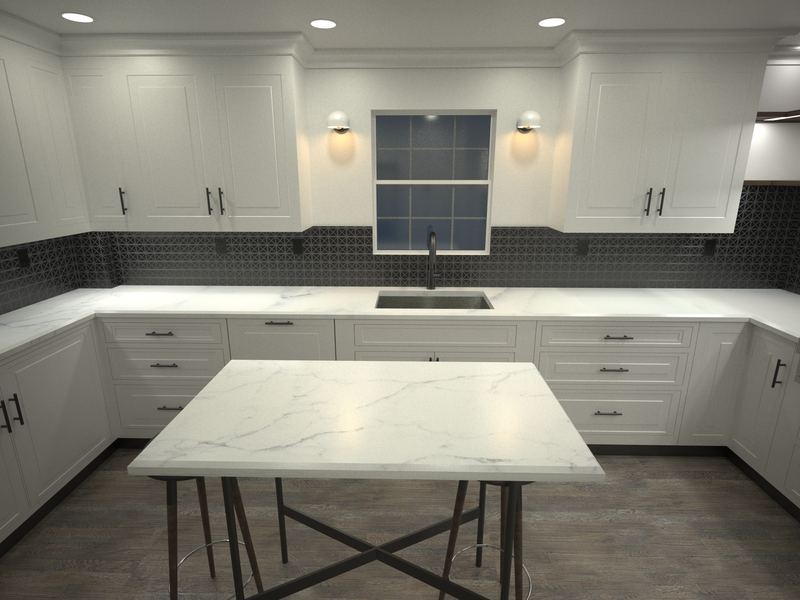 Here is a new render looking at the cook range and the hood straight on. I think it is kind of a helpful view. Lastly, (this might be hard for some of you to watch) we took ButtFuzz out on the porch as we have been doing with some regularity lately. I mentioned to Kate that maybe we should take her down into the yard to get those little paws on some grass. It’s been almost a decade and thought it might be nice. As you will see in this short video, that was not the case. What’s weird is that ButtFuzz seems to take off without any provocation. She just bolts for the door. That poor little turd just wants to be inside. 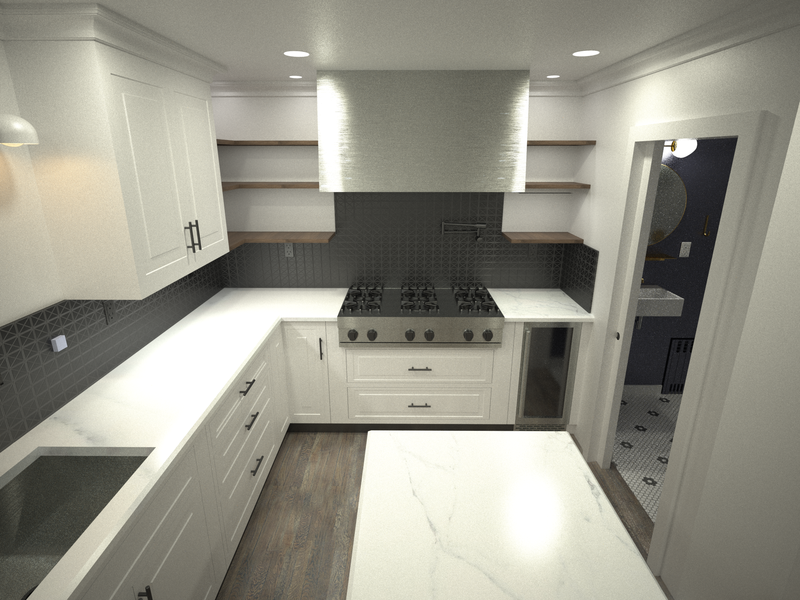 The 2018 Kate and Paul Diehl kitchen project is moving forward! After a devastatingly high estimate from the contractor we recorrected and went to plan B. Find our own sub contractors. Kate called the carpenter who did our porch and stairs. 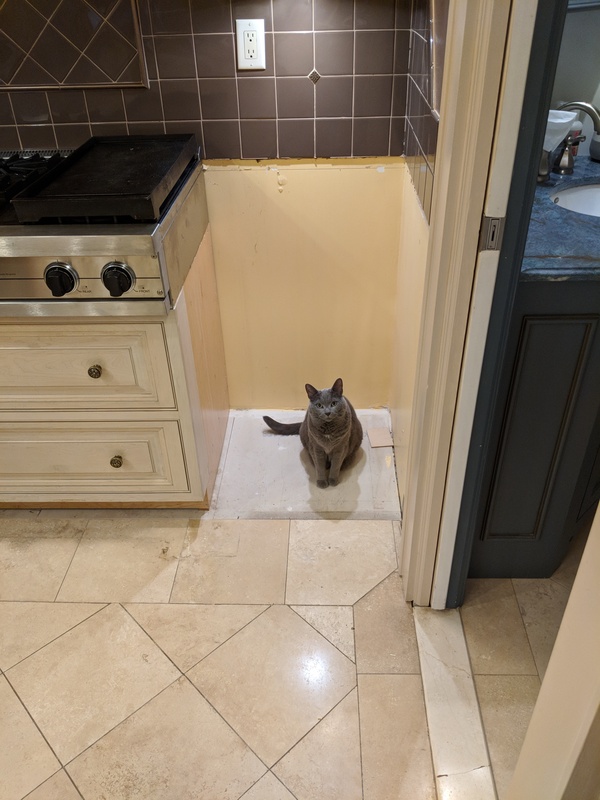 He’s going to do all the nessessary demo and tile work. We got the name of our neighbor’s floor guy and had him over which resulted in a very reasonable estimate. Kate found a countertop supplier and we picked that out. 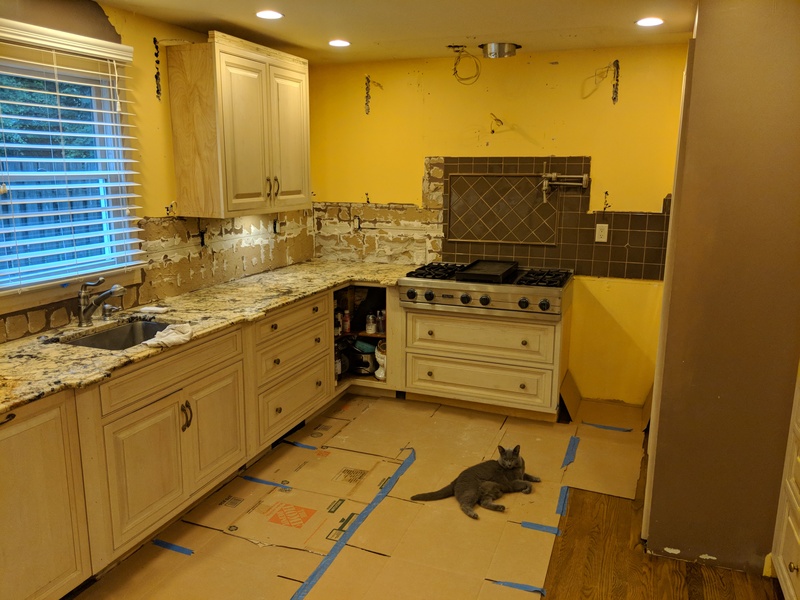 I have updated the spreadsheet and have started to order the tile and fixtures. 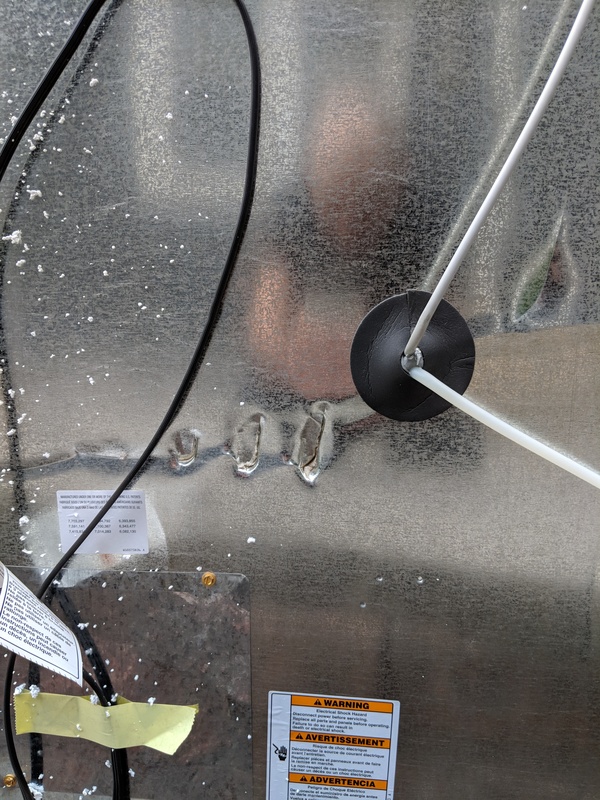 I sent drawings to a fabricator to get the range hood made and got a quote back. 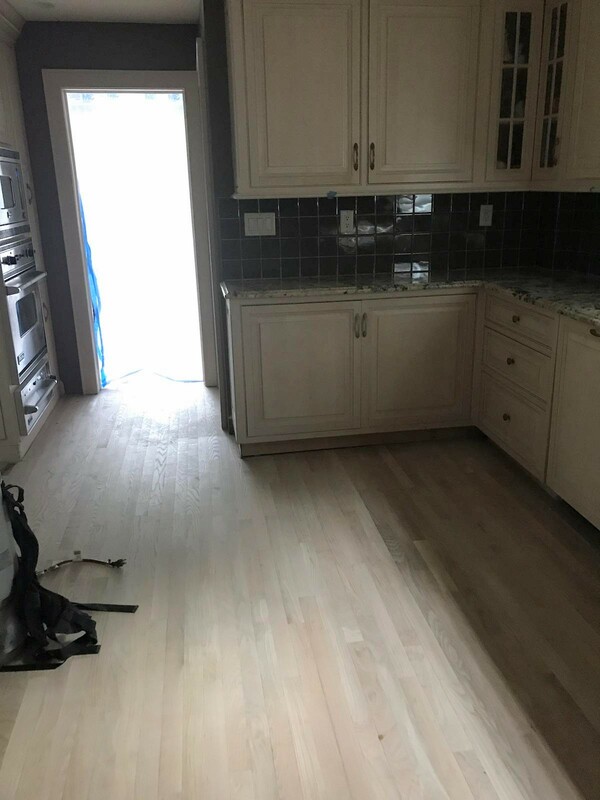 All we have left is to find a painter for the cabinets. This is the big one. 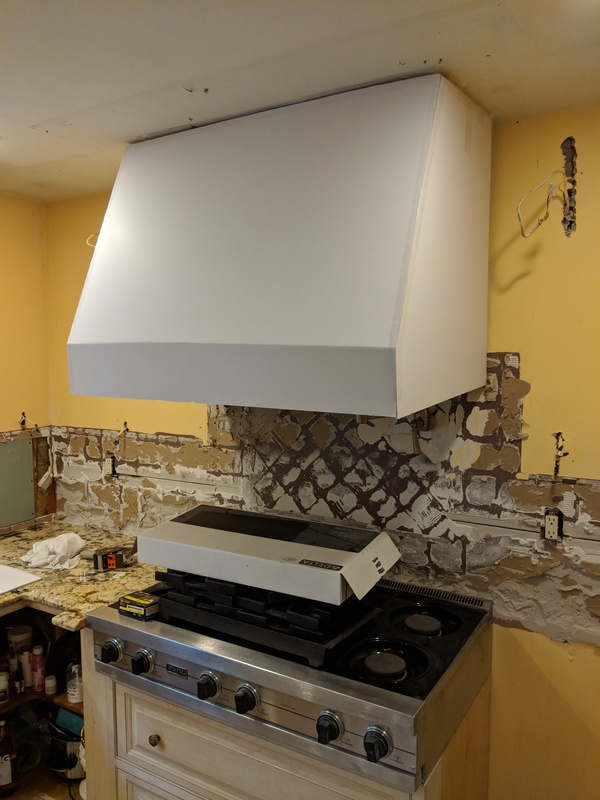 If we don’t find a good painter for these cabinets I’m worried the entire project may fall apart. Before you label me a dramatic let me explain. 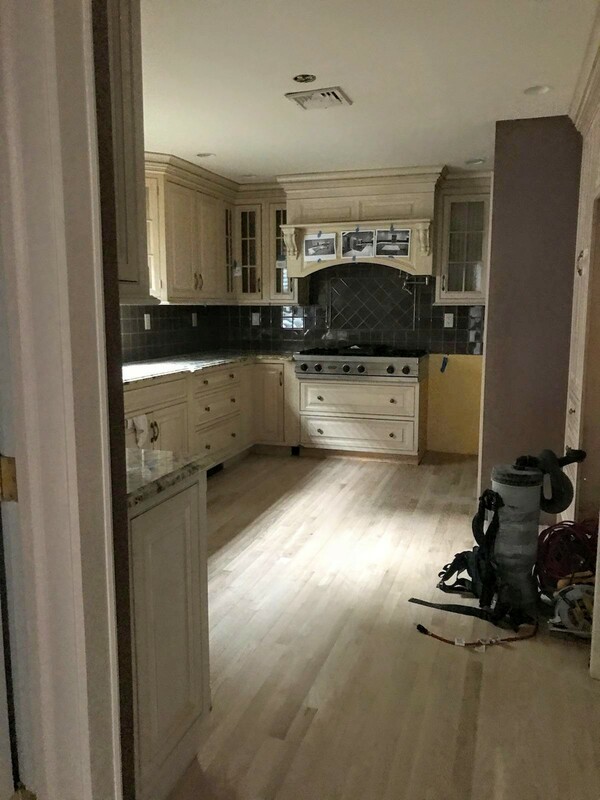 We have a lot of cabinets in that kitchen. 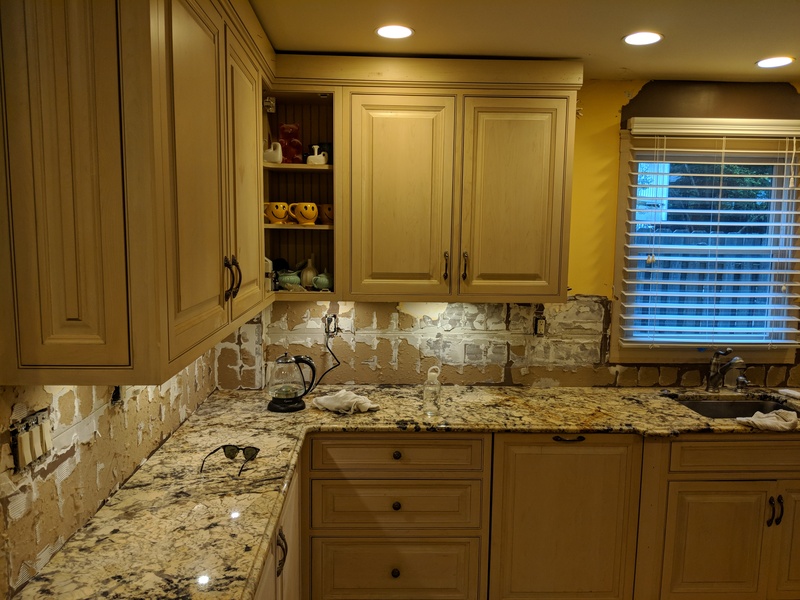 If the paint job looks like a paint job, and not like the natural color the cabinets have always been, then all the other improvements we have spent on will look cheap by association. Trust me on this one. That said if you know anyone in the NJ area that is famous for painting cabinets sent me that contact! 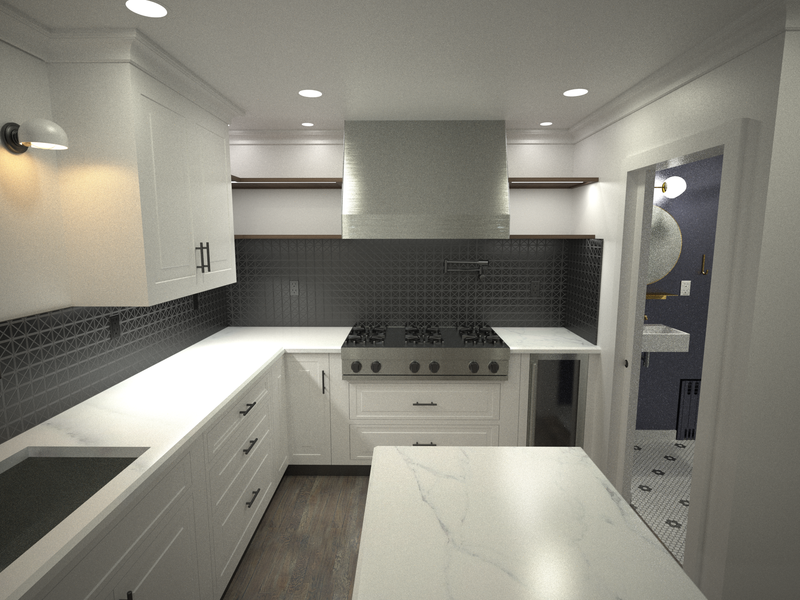 I did another render of the kitchen with the wider sink we ordered and now have in the basement. Demo starts next Monday the 11th. I will post regular updates. Wish us luck! We went to the Met game last Friday with Lisa and Mike to see the Mets lose in classic fashion to the Cubs. This is a frustrating season for the Mets. The bullpen is a disaster. The last 11 games the starting pitcher has done well to put the Mets in a position to win. The bullpen comes out and in a matter of 4 pitches loses the game. It’s stupid. Friday was no exception. Wheeler pitched 6 great inning and Paul Seawall came in and blew it instantly. 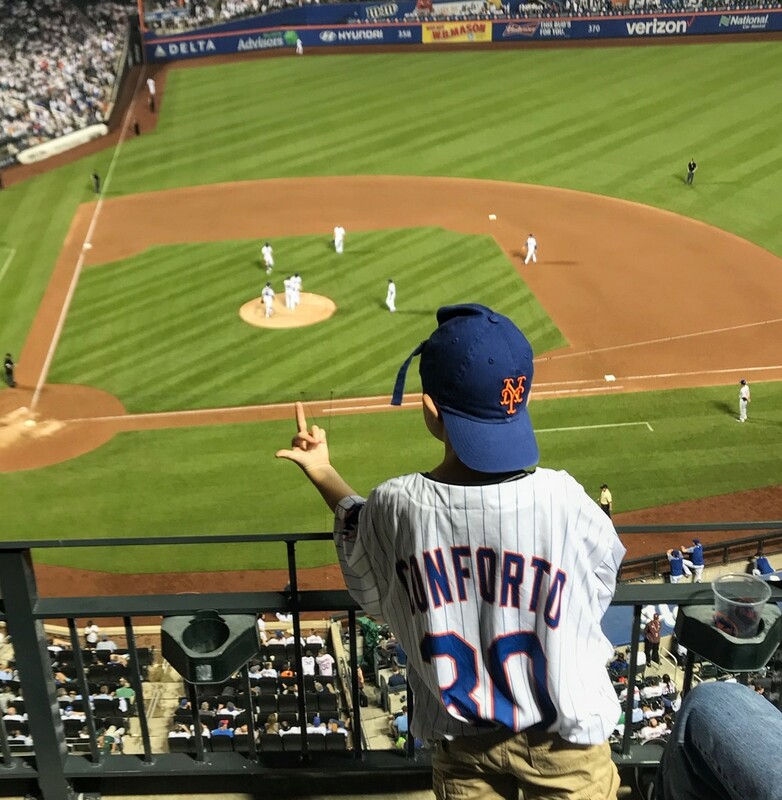 Mike took the picture below of a Met youth doing what the entire stadium was feeling. Other than that it was a beautiful night. Great weather. Nice to see Lisa and Mike. 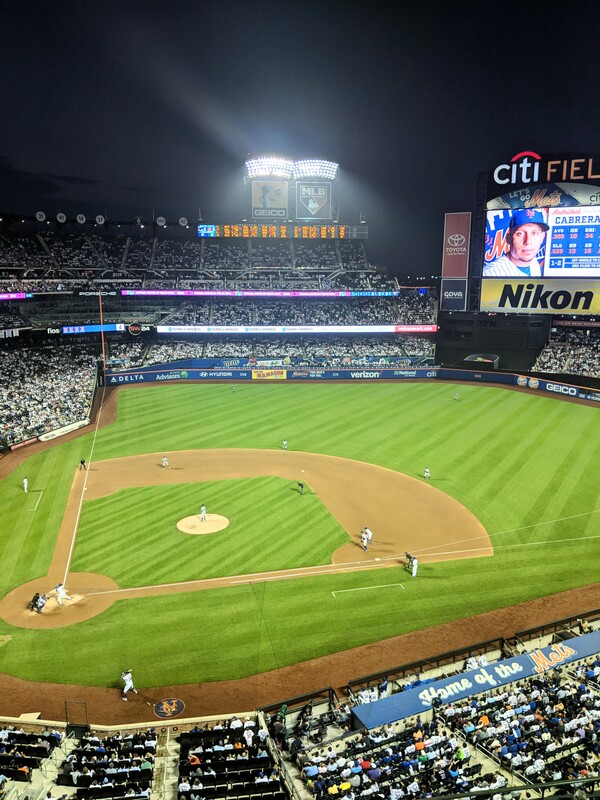 Always great to get to a game at Citi Field. Plus it was free shirt Friday. We got the Conforto jersey seen below. Kate and I drove into the city to do a few things and then head to Megan’s house warming. In February she moved from the LES to Brooklyn Heights. 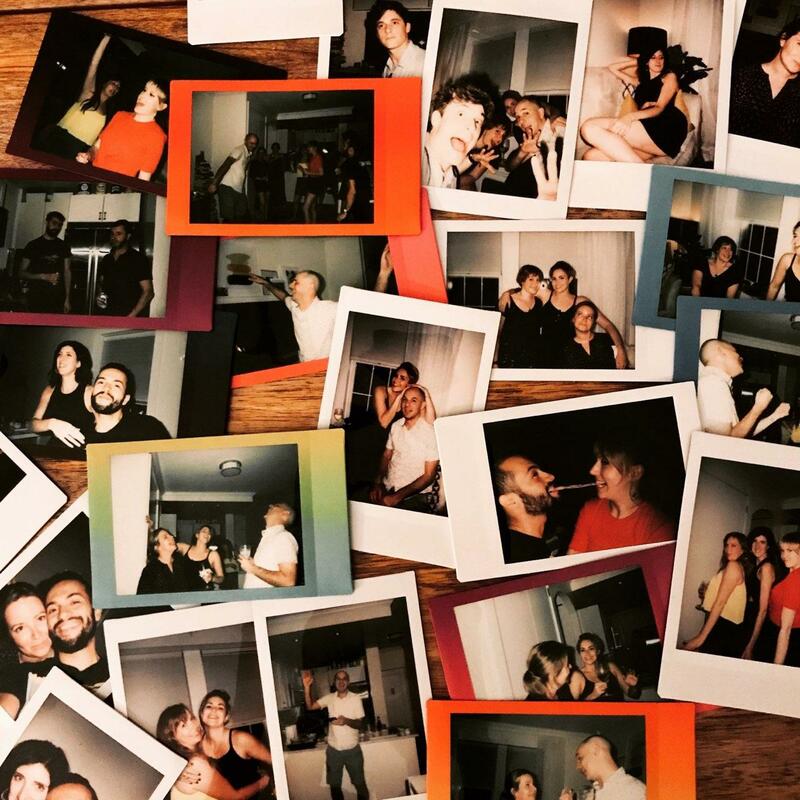 She has a lovely place and it was fun to see everyone. We stayed over since we drove. 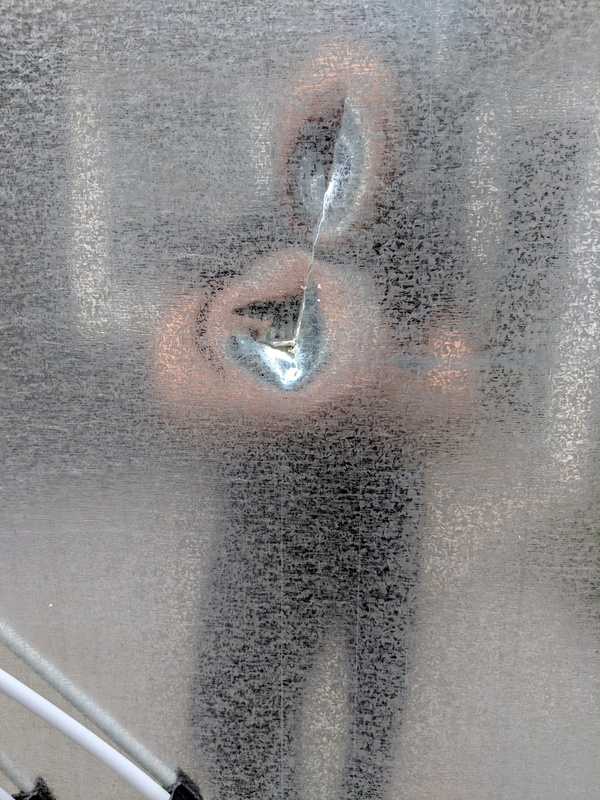 Early Sunday morning I got a call from our home security that the internal sensor was triggered and the alarm went off. ButtFuzz was messing with the Hibiscus tree and it tripped the alarm. Apparently the cops came and it was a mess. Kate was worried about ButtFuzz since the cops had been there so we raced home. From BK Heights to West Orange in 33 min. Crazy!